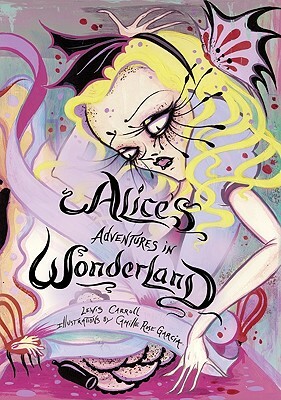 A beloved favorite work of fiction for readers young and old, Alice’s Adventures in Wonderland has inspired many artists to visually interpret the tale over the years, but none with distinct, edgy style of renowned artist Camille Rose Garcia. A novel, richly illustrated, and colorful interpretation of Carroll’s story, this deluxe volume, printed on a beautiful, thick paper, captures the imagination with a wealth of stunning four-color art throughout, including full-page illustrations to open every chapter, numerous double-page images, and plenty of delightful whimsical art in between. The use of gold ornamentation and type throughout enhances this very special volume, which became an instant New York Times bestseller upon publication. Charles Lutwidge Dodgson (1832-1898), better known by his pen name Lewis Carroll, published Alice's Adventures in Wonderland in 1865 and its sequel, Through the Looking-Glass, and What Alice Found There, in 1871. Considered a master of the genre of literary nonsense, he is renowned for his ingenious wordplay and sense of logic, and his highly original vision.